Wednesday July 16th 1884. We wrote home this morning and then took a ride around the lake and was gone most of the day. I worked on Hatties shawl some and spent the evening in the parlor. Thursday July 17th 1884. It was a rainy morning but was spent pleasantly in doors. The boarders here who are most pleasant take a great interest in Rob. We walked out awhile after dinner. Friday July 18th 1884. We wrote letters this morning and put in time at the house and in the afternoon took a walk over to the lake. There was a ball here in the evening. We watched them dance. Saturday July 19th 1884. It was a pleasant day. We wrote and talked all the forenoon and after dinner took a ride in the lake The gentleman of the house were nearly all out fishing and brought home lots of fish We had a letter from home. 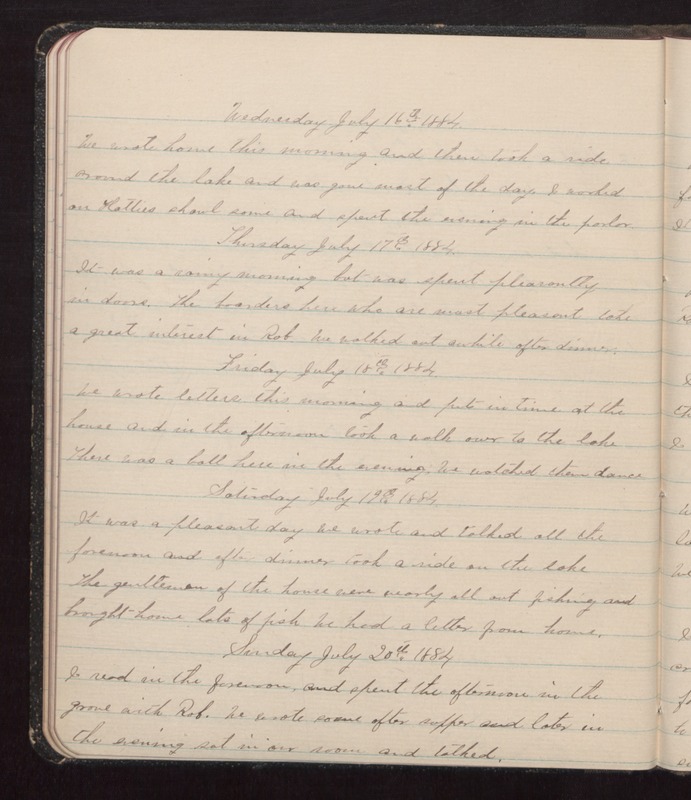 Sunday July 20th 1884 I read in the forenoon, and spent the afternoon in the grove with Rob. We wrote some after supper and later in the evening sat in our room and talked.